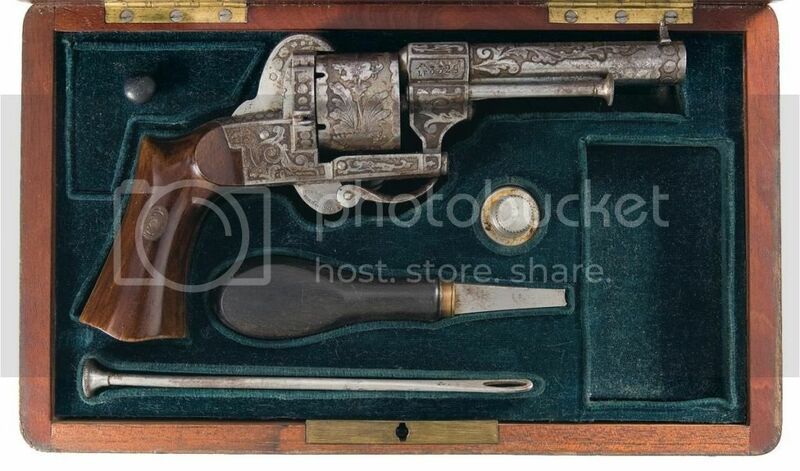 Often you see antique guns in an original case. Cased guns are valued much higher especially when it includes nice and correct accessories. But one should be careful when buying a cased gun. Most times it will actually be an original case but also often it is not. It is possible that a case was provided by the factory or gun maker or that the new gun owner had it made later by a craftsman. But it is also possible that the case was made much later or even just weeks before it is offered for sale. If it is a decent case, looking authentic and the gun and case have the same patina you buy a nice set. But when the wear to the gun is quite heavy, how would that happen to a cased gun? Sometimes strange accessories are seen in a case like binoculars, a watch or a liquor flask and glasses? That is because the case was to big! I have seen strange combinations go for high prices on Internet. A €100,- gun + a €30 case + €50 in materials and accessories = €500,- ? Think and research before you buy a cased gun. It is not that difficult to make a cased gun. See these examples. And I made them nicely, If I would age it a little you would believe it is old. And this is a more difficult way, often I see the "French style" one takes out the form of the gun in wood board. Fabric is glued all around the border and fabric on of the board. A section for bullets and a section for something else and ready.